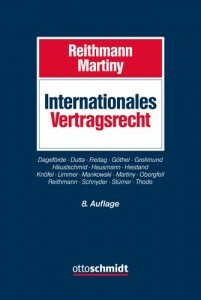 Dr. Christoph Reithmann and Professor Dr. Dieter Martiny (editors) have just published a new edition of their standard treatise on international contract law: Internationales Vertragsrecht – Das internationale Privatrecht der Schuldverträge, 8th. ed., Cologne (Dr. Otto Schmidt) 2015. 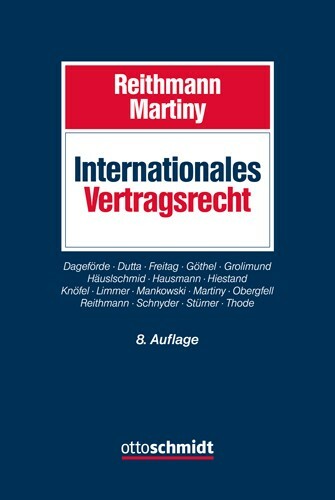 This 2348-pages strong volume is universally acknowledged as one of the leading works on international contract law in the German language. It features in-depth analyses not only of the Rome I-Regulation, but also of various aspects not dealt with in Rome I, such as capacity and agency. Moreover, it also contains a chapter on choice of law under the Rome II Regulation. The book has been written by a team that is made up of renowned German and Swiss PIL scholars and practitioners. Highly recommended! For further information, see the publisher’s website here.